We’re excited to officially introduce and invite you to participate in our latest Maui bike initiative, Maui Cycle Exploration! 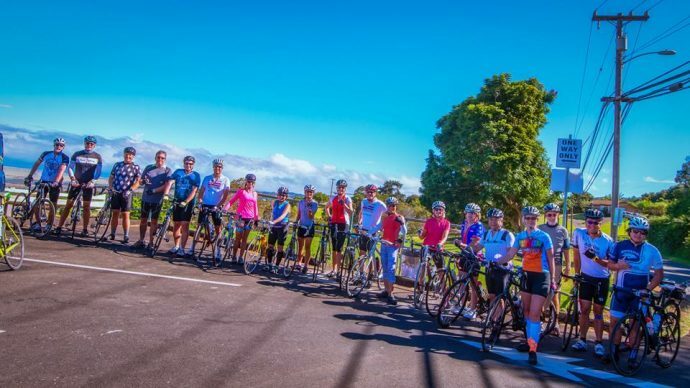 Thanks to support from Hawai’i Tourism Authority‘s Community Enrichment Program, Maui Bicycling League will be hosting a series of island-wide bike rides, providing a unique, scenic, memorable and safe experience for Maui residents and visitors alike. Bike rides will be led by trained MBL ride leaders who are knowledgeable of existing bike infrastructure and facilities, rules of the road, safety and cycling etiquette. We’ll be partnering with a different bike shop each month that will provide ride support and supply gear to rent for those who do not have a bicycle or helmet (required for all riders). Bike rides will take place the second Saturday every month unless otherwise stated, with the first taking place on February 16. Please follow us on Facebook and check our website calendar for bike ride dates and details. We look forward to riding with you! February 16 – Honokowai Marketplace to Nakalele Blowhole – 25 miles round trip. Google Maps Route. March 9 –Kalama Park Pavilion to ‘Ahihi Bay – 19.3 miles. Google Maps Route. April 13 – Kahului to Charley’s Restaurant & Saloon (Paia) – 11.9 miles round trip. Google Maps Route. May 18 – Boss Frog’s Kihei to Target Kahului – 22 miles. Google Maps Route. The official Ride of Silence for the island of Maui, part of the global movement in honor of cyclists who have been injured or killed. Learn more. SIGN UP FOR A RIDE! Who should attend the rides? Most of our rides are geared toward intermediate to advanced cyclists, who ride an average of 12-14 mph. Rides will ALWAYS be led by trained leaders and no participant will be left behind. Maui visitors and residents are both welcome! Do I need to RSVP? Yes! To ensure cyclists are safe and non-disruptive to the flow of traffic, rides are capped at 30 people. Please book online to reserve your spot. Is there a cost to participate? 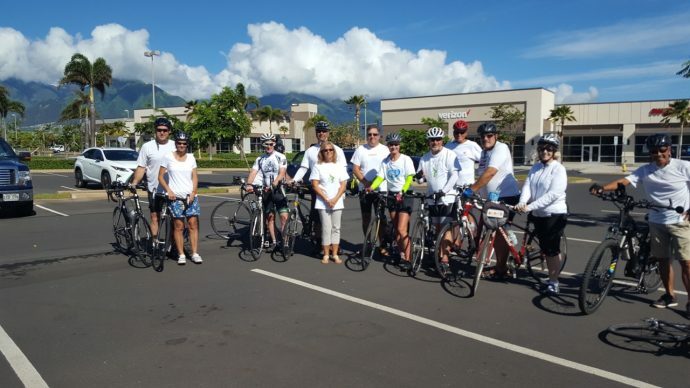 There is no cost to participate in this maui bike ride, thanks to volunteers and support provided by HTA’s Community Enrichment Program. Gear rentals can be purchased from the participating bike shop directly. We are accepting small donations to continue this program on an ongoing basis, donations can be made at time of booking. Q&A: Where does my donation go? Your donation will help the Maui Bicycling League, a volunteer led 501(c)3 non-profit organization, educate hundreds of residents and visitors through safety campaigns such as “Share the Road”, host events and group rides, and develop and support programs such as Maui Cycle Exploration. We depend on funding to continue and increase our ability to advocate for cycling and pedestrian infrastructure improvements all over the island. What should I bring? Bring your own bike or rent one from our participating sponsor. Other recommended items include: sunscreen, water, snacks, money for lunch stop or food item for post-ride potluck (when scheduled). Please refrain from wearing earbuds. What if I get hurt or get a flat tire? We will be partnering with Bike Shops across the island to help support our rides. A support vehicle will follow the group with first aid, spare equipment and other resources. What are the requirements for a Bike Shop sponsor? Commit to a day and help with the logistics, planning and promoting of the ride. Have an adequate stock of rental equipment that. A maximum of 25 cyclists will be able to participate in each maui bike ride to ensure the experience is safe and does not disrupt the flow of traffic. Provide a support vehicle for the duration of the ride with basic supplies such as bike pumps, first-aid and patch kit. If you are unable to provide a support van lets find a way to partner with another bike shop. Think of creative ways to accommodate this request. How can I get involved with Maui Cycle Exploration or future projects? Email us at Maui@hbl.org! As an entirely volunteer-led organization, we constantly are looking for ride leaders and other volunteers who are interested in helping us carry out our mission.